I buy this Jeep in June 2016 after a long search because I was looking out for a Jeep,if possible with the original engine and Gearbox. At last I found one near the place I live, Lamphun, sadly with not the engine that I prefer, but I can live with the Isuzu 2500 diesel engine. The Jeep has a lot of interesting extras which makes it a very nice specimen. 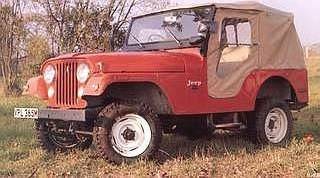 It has power steering, broad tires with steel (not plastic) fender extensions, disc brakes at the front axle, plus power brakes, a shaft driven winch, wheel hub locks at the front wheels, a differential lock at the rear axle, and of course the right hand drive. The Jeep is used as a daily driver. I also used the Jeep for long holiday trips on a lot of jungle roads. I enjoy the Jeep very much,but although I am thinking now to turn back to my old love, a Land Rover '88, so I am willing to sell the Jeep or to swap against a original SWB Land Rover.